Ever since I heard Sanchita Balachandran’s presentation on conserving human remains at the London seminar last September, I have thought about this issue. Over the past several months I have been reading some interesting books on the exhibition of human remains, and last week I attended the annual ICOM Denmark meeting, where the theme was ‘Debating Museum Ethics’, which covered several topics, among them illicit trafficking and provenance issues, and deacquisitioning of museum objects. I will endeavor to write a more complete report on the presentations and discussion from that meeting for the next WG Newsletter, but here I would like to focus on the topic that dominated the discussion at that meeting: the issue of human remains displayed in museums. The following is a compilation of my readings and the discussion from the ICOM meeting. One of the critical questions regarding the issue of human remains in museums deals with the ethical or moral stand of exhibiting and viewing a dead body. This might seem paradoxical in light of the fact that modern society is visually bombarded with dead bodies, for example, in forensic crime series on television. Nevertheless, viewing a human body directly in a display case does stir primordial feelings in many people. 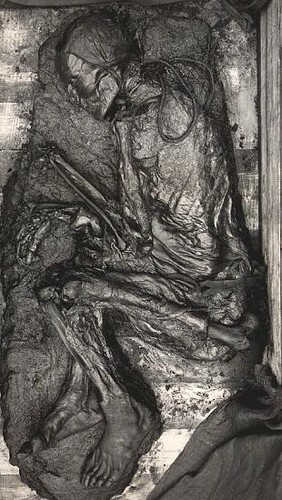 Karin Sanders (Bodies in the Bog and the Archeological Imagination, The University of Chicago Press, 2009) takes the question even one step further by speculating whether the study of photographs of the dead bodies is also unethical, and whether this can be done without ‘scarring’ the viewer’s soul. Figure 2. 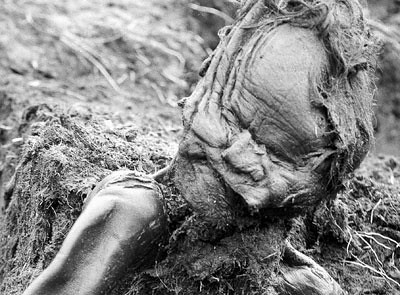 The Tollund Man, as found at the excavation site. Foto: Reproduced with permission from Silkeborg Museum. Figure 3. 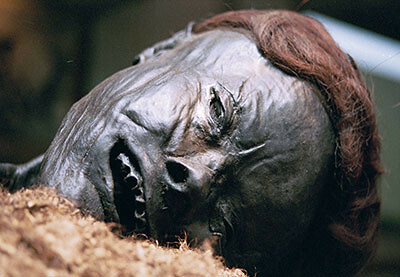 The Tollund Man, as exhibited in Silkeborg Museum, Foto: Reproduced with permission from Silkeborg Museum. Figure 4. 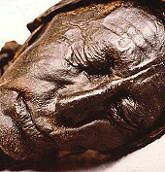 Detail of the face of The Tollund Man. Foto: Reproduced with permission from Silkeborg Museum. Bodies found in bogs examined with modern scientific methods, such as CT-scans and pollen analyses, have revealed information about lifestyles and diets. One might claim that ethical issues regarding exhibiting these bodies fade in the face of the historical value they represent. However, we can debate whether aesthetics should play a role in the conservation interventions on human remains. In Pauline Asingh’s book (Grauballenmanden. Portræt af et moselig [The Grauballe Man. A portrait of a bog body] Mosegård Museum/Gyldendal, 2009) we read that the appearance of the body as seen nowadays in the Mosegård Museum can be credited to the efforts of the conservator Lange-Kornbak, who was trained as a sculptor, and used modeling wax to reform parts of the collapsed muscle mass and cartilage (Figure 5 and 6). This was presumably done because viewing the deformed face was thought to be too distressing. However, the cosmetic interventions seem to diminish its scientific significance. Figure 5. Head of The Grauballe Man, as found on the excavation site. Foto: reproduced with permission from Moesgaard Museum. Figure 6. Head of The Grauballe Man, after restoration. Foto: Reproduced with permission from Moesgaard Museum. 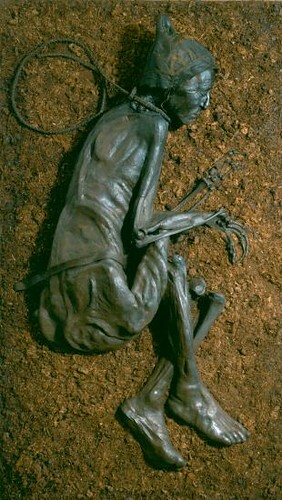 Seen from the moral point of view, few modern Danes probably consider themselves descendants of the bog bodies. After all these were not Christians. The exhibition of human remains of Christians seems to be more problematic. At the museum next to the ruins of Æbelholt Cloister there are some skeletal remains displaying evidence of diseases plaguing medieval society. But most skeletons found during the renovation of medieval churches are reburied in the consecrated ground. No remains of bodies of Protestants are on display in Denmark (the current official religion of Denmark is Protestant Lutheranism). It seems that the shorter the time lapse between the ancestors and descendants, the more forceful the ethical issue of exhibiting becomes. One of the current major ethical issues in museums focuses on deacquisition and repatriation of ancestral remains. The debate here takes on a tone of political correctness. In fact, many of the decisions pertaining to deacquisition of ancestral remains can be viewed more as political rather than ethical issues. Sometimes this act involves politicians at the highest level of national government, such as John Howard, who went to England and personally requested of Tony Blair the return of the aboriginal ancestral remains and objects of their cultural heritage. There were several comments at the ICOM meeting on why the human remains issue dominated the discussion on ethics in museums. One panelist answered that we all regard human life as sacred, and this is reflected in our interest for human remains. Another panelist suggested that most of those present were from museums of cultural history dominated by archeological objects, whereas a stronger presence of museum professionals from art museums might shift the discussion. I could feel myself agreeing with this point of view. As a wall paintings conservator I have sometimes stood in awe of the objects I regard or work on. When I visited Italy in 1997, the masterpieces of Giotto in the Basilica in Assisi rendered me speechless. Two weeks later, when I heard about the earthquake that destroyed parts of the vault he had painted and took the life of two friars, all I could think about were the paintings. The value of those paintings was greater to me than human life. Another viewpoint was presented by the director of the Medical Museion in Copenhagen. He talked about several cases where Catholic priests had requisitioned parts of human bodies on display in the museum for burial in consecrated ground. Why are we not as outraged by the destruction of medical heritage as by the destruction of artistic patrimony, such as the destruction in 2001 of the Buddhas of Bamyan? These issues are very complex. The keynote speaker at the meeting, Chair of ICOM’s Ethics Committee and National Director of Museums Australia - Bernice Murphy – thought that it was impossible to separate ethical or moral issues from political issues. She asked us to consider the case of aboriginal ancestral remains forcefully taken by the colonizers (a political issue) where there are descendants still alive today directly related to those ancestors and who remember the event of acquisition (ethical issue). Think, she asked us, how you would feel if this was your grandmother on display? I will stand a long time. For miles along the lines.